Students at Bev Facey Community High School in Sherwood Park, Alberta, Canada are immersed in an innovative digital media experience that enriches their academic lives. They’re never far from visually dynamic, big-screen displays that showcase all school activity. Partnering with Tightrope Carousel, Bev Facey has transformed the way students receive information, whether in the gym, cafeteria, drama room, hallways or elsewhere in the building. At the morning bell, they watch live video and highlights instead of listening to announcements over the PA. Looking at the digital signage displays, they can watch “Facey TV” morning newscasts, complete with iMovie clips and other multimedia-rich content produced by students. Facey TV is the high school’s HD studio equipped with multiple cameras, a set, and a green screen for live graphics and virtual set compositing. While Facey TV produces many programs, the morning newscast features student anchors reading the morning announcements and introducing video segments. This gives students an early advantage in learning about digital media from production to broadcasting. Tightrope Carousel’s digital signage network, which was installed by Digital Edge Media Inc., is so impressive and successful that it has inspired 12 other Edmonton schools—including 10 public high schools, one Catholic high school and one public junior high—to adopt it. “We’re seeing dramatic growth in the use of digital signage by the educational market,” said Mark Silvius, president of Digital Edge Media, an A/V integrator specializing in digital signage solutions, with offices in Edmonton, Calgary and Vancouver, Canada. Digital Edge Media plans to install the same Tightrope Carousel network—including the Web-based Carousel server 310 and Carousel Player 310 networked appliances—at 12 other Edmonton-area schools in the near future. Plans are also in motion to bring Carousel digital signage technology and its associated production workflow to schools in Calgary and Vancouver. Digital Edge Media recommends Tightrope Carousel because it is the only digital signage solution that supports the unique, flexible workflow the Edmonton schools require. Digital Edge Media worked with the school’s IT department to enable secure log-in access compatible with the school’s firewalls and other IT security measures. This enables remote, Web-based access into the digital signage system for authorized personnel. Unlike many digital signage solutions that concentrate control in the hands of an IT administrator, Bev Facey teachers and students—and a virtually unlimited number of users—can be granted access to input and change the content locally on one or more monitors. Such changes are also possible across the entire digital signage network. Students create and produce the content for up to 14 different digital signage channels, making remote access pertinent. The workflow supports a teacher review and approval channel that allows for evaluation and approval of content before it is posted on the system. Users can also update text, including announcements and calendar events, without disturbing the overall graphical design and visual appeal of the display. Calendar announcements can auto-update direct from Google calendars. 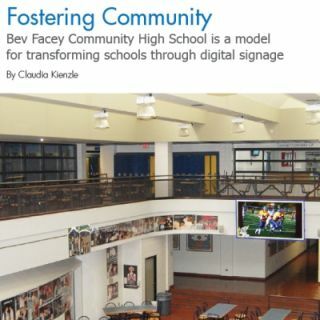 In addition to having total creative control, Bev Facey Community High School also has authority on how content displays on the distributed network. Content can consist of live broadcasts produced by Facey TV, as well as text, RSS feeds, tickers, pictures, flash files and social media. The students responsible for content production—from the communications and digital media track of the school’s Career Technology Studies program—receive academic credit and invaluable experience running this sophisticated digital signage and HD video-over-IP multimedia network. The same content can be displayed on every monitor in the school—including a four-monitor video wall in the gym, a two-monitor set-up in the drama room and a four-monitor video wall in the cafeteria—as well as interactive white-board displays fed by ceiling-mounted projection systems in the classrooms. Individual displays also can be customized to the needs of a specific area or department, such as posting upcoming athletic tryouts or events in the gym or displaying talent show video in the cafeteria during lunch. The school’s two four-monitor video walls can display a single image on all four (60- or 46-inch) LCD monitors, or they can display something different in each zone. Each display can be organized into multi-zone areas, independently programmed and updated. For example, a quadrant configuration can display the lunch menu in one zone, a photo and description of a featured book in a second, a picture of a student’s award-winning artwork in a third and the school calendar in the final zone. A ticker streaming across the bottom can display data, such as an RSS feed of “My Life is Awesome at Facey,” a series of comments regularly posted on the school’s website by students. Bev Facey’s digital signage installation continually pushes the envelope with its many innovative features and applications. Students can play Xbox video games on the cafeteria videowall and download homework using their smart phones to read QR codes on the displays. Students also tweet music requests to the CTS students for playback over the system before school starts. The networking capabilities come into wider focus through sports. Operators can broadcast live sporting event feeds from remote locations and display a custom score clock complete with team logos on the videowall in the gym during sporting events. Digital Edge Media is also in the process of expanding the digital signal network to tie it into the school’s security system. When the upgrade is implemented, the Carousel server will be able to automatically switch over to display the necessary fire evacuation plans, such as instructions for locating the nearest exit, if the fire alarm is pulled—whether for a drill or the real thing. According to Mark Silvius, the improvements could include a “mushroom button” in the principal’s office that causes the school’s exterior doors to lock when pressed — especially pertinent if an intruder is noticed on school grounds. Silvius explained that in the event the school goes into a lockdown mode, the Carousel server would automatically switch to displays that give building occupants emergency information on where to go, what to do and how to stay safe. All of this makes Carousel more than a simple digital signage system. Bev Facey has taken digital signage in education to new heights, offering the student body a rich digital media experience that fully integrates into student life—both as part of the learning experience and simply to inform and entertain.